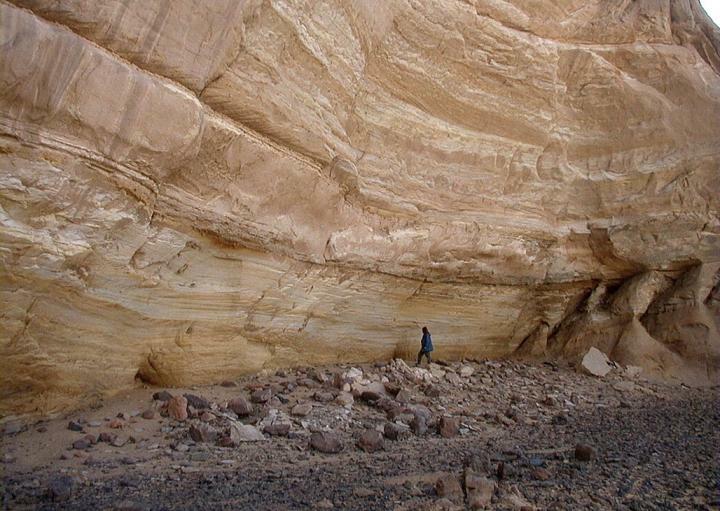 The team has been investigating findings from an ancient rock shelter at a site named Takarkori in south-western Libya. It is desert now, but in the Holocene age, some 10,000 years ago, it was part of the "green Sahara" and wild cereals grew there. More than 200,000 seeds – in small circular concentrations – were discovered at Takarkori, which showed that hunter-gatherers developed an early form of agriculture by harvesting and storing crops. A new article that describes the latest findings and the lessons to be learned appears in the journal Nature Plants. Titled Plant behaviour from human imprints and the cultivation of wild cereals in Holocene Sahara, it is co-authored by Anna Maria Mercuri, Rita Fornaciari, Marina Gallinaro, Savino di Lernia and Dr Vanin. Research based on findings at Takarkori continues. Dr Vanin is supervising PhD student Jennifer Pradelli – one of a cohort of doctoral candidates at the University of Huddersfield funded by a £1 million award from the Leverhulme Trust – and she is analysing insect evidence in order to learn more about the evolution of animal breeding at the site.